The Great American Snowmobile Ski Test Part V: The Simmons Gen III Flexi Ski. Will these ski wars ever be done? Hell no! As long as there is American exceptionalism and ingenuity at work here in the USA, this reporter will bring product tests to the dedicated readers of sledmass and performance hungry snowmobilers. Know this: I still believe that the greatest single performance upgrade you can make on your sled is better skis. Think about it. You could have 300 horsepower under the hood, 500 studs on the track and the lightest chassis in the world but if you can’t turn a corner with precision what good are the other performance goodies? Let’s face it, money is tight these days so every performance dollar counts. New skis will make any sled wake up. You’ll swear you just bought a new ride. Remember, money spent on aftermarket skis will pay you twice, once when you install them and once again when you take them off to mount on your next snowmobile. Last season the MoHawk by SLP won the top-gun ski award against all comers as it garnered a maximum five out of five carbide rating by yours truly. How would the Simmons stack up? Would it unseat the newly crowned king or be relegated to court jester status? And so it was that I placed a call to Verlin Simmons, one of three owners of Simmons Skis. He was most gracious in sending me a pair of Gen III’s to test. As most of you remember I tested the original Flexi Ski early on and it got rave reviews. For you history buffs, Simmons is the ski that really started it all, with stellar bump absorption and cornering precision. They were the one who thought out of the box and designed the Flexi Ski, a world-beater design when it was introduced back 1994. It looks to me as though Ski-Doo took it, made changes to the original design, and to this day have not wavered from that style platform. The litigation between Simmons and Ski-Doo is something you can research, but suffice it to say, the yellow team from up north seems to have adopted the attitude that if something works, why redesign the wheel? Compared to the original Simmons ski mounted on the sled, the new Gen III is much wider. The Simmons Gen III is one ski that if designed right could really bridge that gap between groomed trail rider and off trail mountain sleds. But is it designed right? The MoHawk ski by SLP is, I think, the first of the big ski makers to try to bridge that gap. Would the Simmons take that concept one step further? Some quick stats on the Simmons are as follows: They weigh 9 lbs 12 oz with carbides and mounting brackets. They are eight inches wide, with massive dual carbide runners, the inside being shorter than the outside. The outside runner has a six-inch carbide on a 17-inch host bar and the inside bar is 9-inches with four 2-inch wear pads. Make no mistake, the Gen III’s are heavier and wider than most stock skis, and you will have a problem fitting two sleds side-by-side on a 8 1/2 foot-wide trailer when so equipped. We got them loaded on my friends clamshell trailer but had to perform some acrobatics to get it done. They do overlap handily. Mounting these snowmobile skis was straightforward on my 2015 Arctic Cat ZR 5000 test mule. The ski really does fit the sled nicely, although aesthetically they look large. I wonder if this is the new normal? Not sure myself, you can decide. Either way, the original Flexi Ski or the Gen III’s, are sure to please. A friend and I had the privilege to ride the Gaspe Peninsula in Quebec last winter, a good litmus test for any skis to prove their mettle. The first day of riding started at about 10 degrees with a brisk wind across the fruited plains of Canada. For the first 50 feet the skis planed right up on top of the snow, much like the original Flexi Ski, but way more pronounced. Neat! Later on in a rough section of ice and wind blown conditions, the ski just laid the trail to rest. It absorbed so much ski shock I had to look down and make sure I was not on ball bearings. Yep, they rode smooth and planed up way better than the original Flexi Ski. Looking good but the real test was yet to come. As we progressed on our journey the conditions changed from wind blown to packed powder, to drifts and then flat as a pancake trails. Not to mention some Volkswagen Beatle sized bumps thrown in for good measure. The trails were sometimes as wide as 9 to 10 sleds, some through fields, others over mountainous terrain… here it was, the ultimate test track. On this day I was The Man, and these skis were The Skis. The skis handled all those conditions with aplomb and vastly exceeded my expectations, tremendously. I just could not get my head around the fact that here I was in one of the most beautiful places on earth, blessed beyond belief to be testing these skis. They perform better than any ski I’ve ever tried before. If there is a snowmobile heaven I must have come real close on that trip. 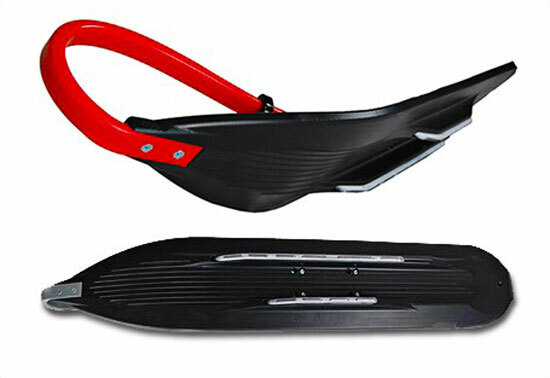 Even backing up or going off-trail to make u-turns, the ski just floated on top of the snow, with ease. Surprising, because the heavy four-stroke could not argue with positive real world results. Carving corners was even more of a surprise as these skis were like scalpels on the trail. Early morning snow, late day snow, icy, rutted conditions, no matter for this ski, it did it all. They even surpassed the mighty MoHawks for cornering precision, and that says a lot because they were the king of snow just last year! The ski hoop handles were easy on the hands and large enough to make moving the sled very easy. I give top ratings to this ski’s ability to carve corners, plane up on the snow and off-trail prowess. It also measures one level better than the original Flexi Ski in bump absorption. There is just one slight ding in regards to the weight of the ski but the performance improvements easily overshadow that minute detail. They are presently the best ski I have ever tried and I’ve tried many on the Arctic Cat ProCross chassis. Admittedly your results may differ on other brands of sleds or riding style, but if I were a betting man I’d wager you would say the same. The Flexi ski gets a five out of five carbides and top gun status going into 2016. Hats off to the engineers at Simmons for delivering us the best of breed. Some people might say that this tester is nuts. Every ski he tests is better than the last. I would like to submit to you that this is what actually happened and is a testimony to the tremendous talent the snowmobile industry holds today. I’m proud to be living and riding in this era of innovation and technology and hope others take advantage of it all. Okay, so what’s next? What ski is going to come out and throw the Simmons under the bus? Whatever it is I can’t wait to test it and when I do I’ll take you for another ride.